We used to hate winter. But living in downtown Toronto, it’s fairly easy for my wife and me to duck - we shop and travel to and from work underground and if we have to venture far from our hibernation cave, we get around in our toasty warm car. I take my running indoors to a treadmill and watch MuchMusic instead of dodging Jack Russell terriers in city parks. But this past January some friends dragged us out to a ski hill, and we went kicking and screaming, too old, we thought, to try such a dangerous sport. In addition to unfortunate collisions with snowfences and twisting limbs into unnatural positions, today’s novice skiers have the additional peril of getting around hot-dogging snowboarders who think nothing of plunking down in the middle of a ski hill to shoot the breeze with their buddies, like a string of well-gelled pylons. That first day I spent more time flat on my back than up on my skis, but with grim determination I licked that bunny hill as the light began to fade. And as I sat wearily in a snowbank, both sets of cheeks rosy and staring up at the frigid sky, I realized to my horror that I had wasted at least twenty perfectly good winters. We were hooked. A growing number of cottagers are winterizing their home away from home because the stress of the rat race doesn’t let up between Labour Day and Victoria Day. With your boat and bathing suit tucked away, there’s still plenty to do in cottage country. Cross-country skiing, snowshoeing, ice fishing, skating, snowmobiling, making angels in the snow, and other wintertime activities beckon. Don’t let another great Canadian winter pass you by - let it snow, let it snow, let it snow! 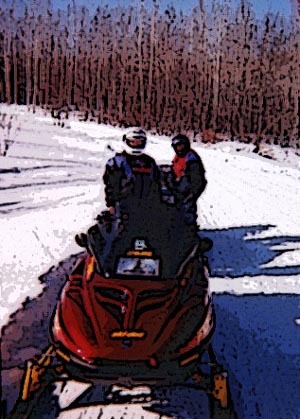 Snowmobiling is a blast, and it’s the theme of our first winter issue. But how do you choose from a growing number of new models now on the market? What should you look for when buying used? That was the assignment we gave intrepid motorsports writer Scot Magnish who talks to the experts and put together our comprehensive buyers’ guide. Check out story 1. Once you’ve purchased your dream machine, you’ll want to open ‘er up and see what she’ll do. Where to go? In Ontario, there are nearly 50,000 kms worth of possibilities. See story 2. There’s something oh-so-Canadian about getting out on the ice. And whether you’re dangling a fishing line from inside an ice hut or playing shinny on a frozen river or lake this winter, safety should be your number one concern. We take a look at the fine art of staying dry - and alive - in story 3. Finally, CottageLink is a great way to advertise the availability of your cottage to readers across Canada and even around the world. On a daily basis, CottageLink president Craig White talks to advertisers about their success stories and over the past five years, he’s learned a thing or two about what attracts - and repels - potential buyers and renters. Take advantage of his advice in story 4. We hope you’ve enjoyed our first year of CottageLink Magazine - it’s been an interesting learning experience for us and we thank you for your e-mails and kind words. Thanks also to the people who took the time to share their wisdom for the twenty articles created for Volume 1 of what we hope will be an extended online run. If you have any comments or suggestions on articles you’d like to see in CottageLink Magazine, just drop me a line at cggarnett@telus.net. Remember - this is your magazine! We’ll be back March 1 to begin our second year of CottageLink Magazine. In that issue, we’ll take a look at all-terrain vehicles, handy for getting to remote cottages and camps, as well as a thrill for kids of all ages. We’ll also slither into the world of the Massasauga Rattler, the only venomous snake in eastern Canada and an endangered species. And we’ll look at ways to increase peace of mind for older cottagers, off the beaten track and far from families.